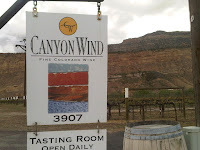 That's the slogan for the Canyon Wind Cellars 47-TEN series which, after spending four days in the Centennial state for the 2012 DrinkLocalWine.com Conference, we learned is applicable to the entire Colorado industry. Not only was I fortunate to attend the conference, but the folks at the Colorado Wine Industry Development Board included me on a pre-tour of the state's two American Viticultural Areas (AVA): the West Elks and Grand Valley. 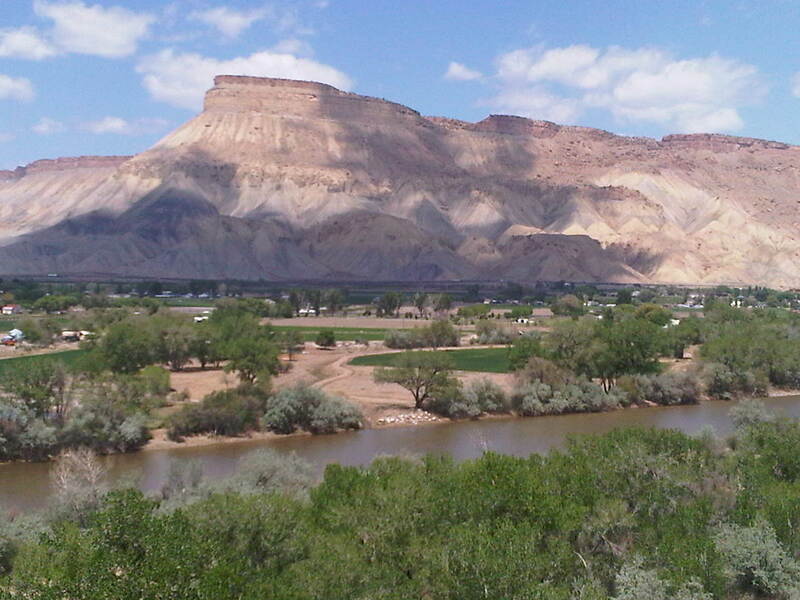 These AVAs are located on the Western Slope of Colorado with the former lying south of the Grand Mesa and the latter to the west. We started our tour in the West Elks AVA and quickly learned about altitude - this AVA hosts the highest vineyard in the Northern Hemisphere, Terror Creek Winery, which sits at 6,417 feet above sea level. You would think this is the land of cold climate hybrids, but no, vinifera is the norm - specifically Alsatian grapes such as Gewürztraminer and Riesling as well as Chardonnay and Pinot Noir. 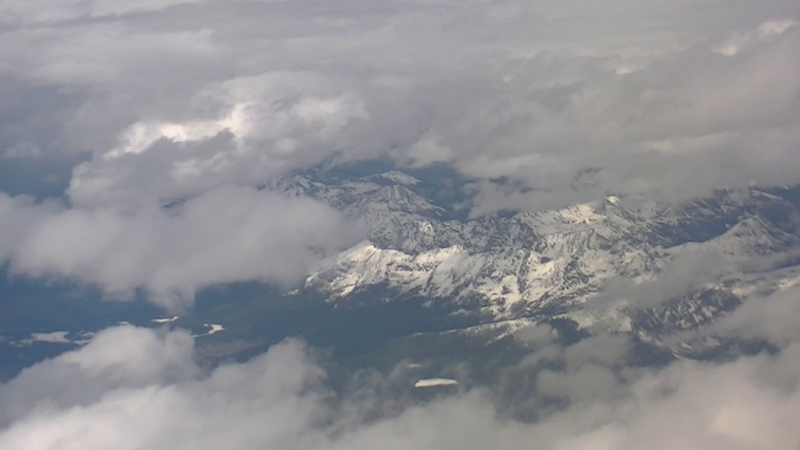 The high altitude induces higher acidity in the grapes and less sugar - resulting in lower alcohol wines. And most interesting, phylloxera is basically non-existent so that vines are not grafted to rootstock. 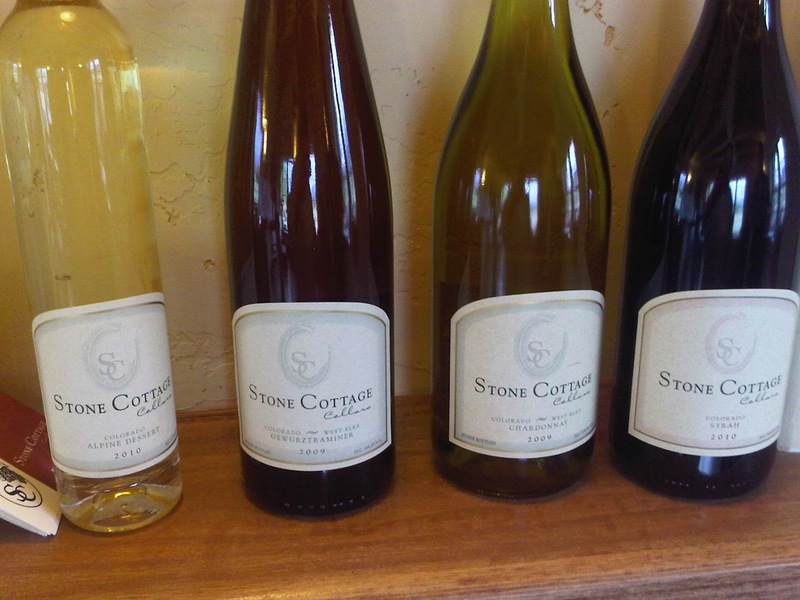 Located just below Terror Creek is Stone Cottage Cellars, the 2nd highest vineyard and our first stop of the tour. Proprietors Karen and Brent Helleckson explained to us the hazards and difficulties in cultivating grapes at this altitude. The growing season is extremely short, 150 days, which can be shortened - as frost sometimes occurs as late as June. 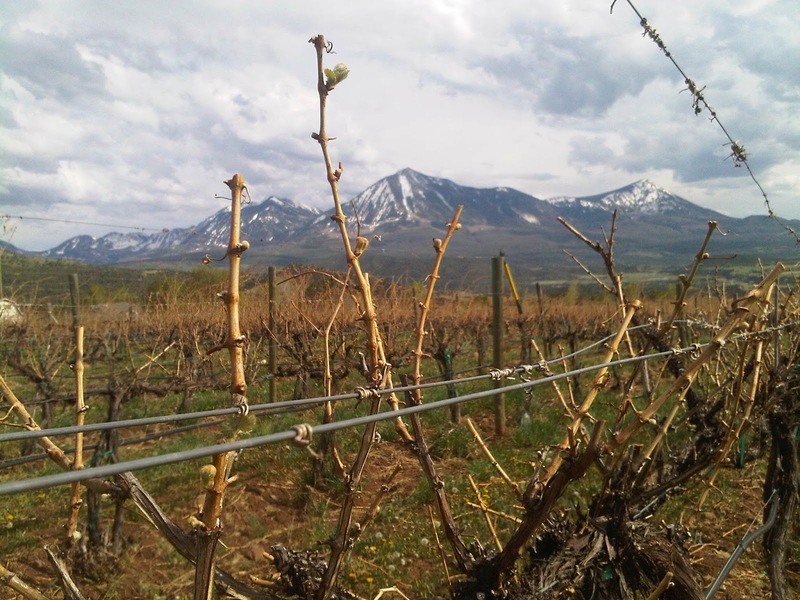 Since bud break normally occurs in early May (late April this year), a late season frost can decimate a vineyard. Another hazard is pests, all American vineyards battle birds and deer, but for Colorado, include Elk, Raccoons, and wild Turkeys. Because of these weather and animal hazards, Helleckson prunes to 6 buds, because any less could result in zero fruit. 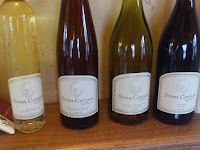 During our visit, Stone Cottage Cellars was pouring a dry Gewürztraminer, a Chardonnay, a Grand Valley Syrah, and a dessert wine - the Alpine - a Gewürztraminer based wine fortified with grape spirit. 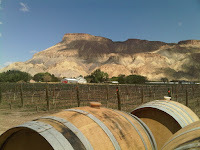 We were also able to sample two wines in the tank, the soon to be released 2011Gewürztraminer and the 2009 Pinot Noir. Ironically, my favorites were these last two. Their dry Gewürz was good, but the extra residual sugar (.6%) in the 2011 vintage lifted the aromatics and exuded stronger flavors - all balanced by the grape's natural acidity. This 2011 Gewürztraminer will be a very good wine. As for the Pinot, it is a very fruit forward red with somewhat of a silky mid-palette leading to the smooth finish. That evening we revisited their Chardonnay during a dinner hosted by the Smith Fort Ranch. The Burgundy styled wine - really held its own during the initial course (of course I can't recall the actual pairing). I also enjoyed the Alfred Eames Cellars Collage (Cabernet Sauvignon, Cabernet Franc and Merlot blend) at the ranch. 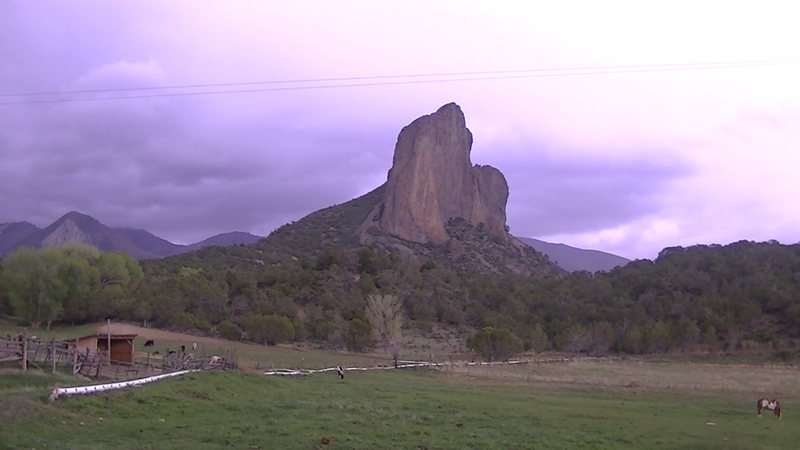 Eames was one of Colorado's earliest winemakers - and seems to specialize in red wines. One day I want to sample his local favorite - Carmena (a blend based on the Carmine grape with some Merlot and Cabernet Franc. 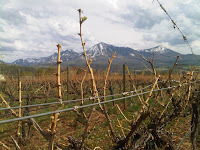 Although lower in elevation and more temperate, wineries in the Grand Valley AVA - and in our case the wineries within Palisades - face constant weather challenges. 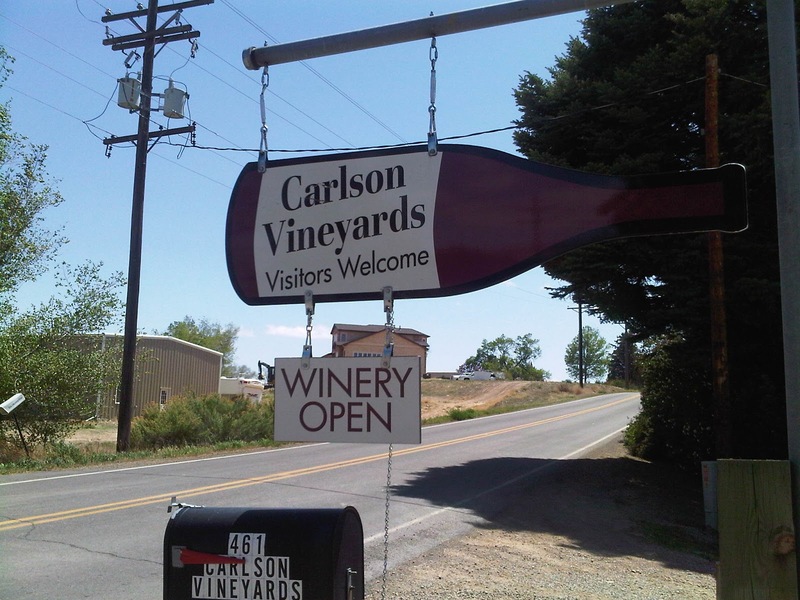 For over 30 years, Carlson Vineyards has been producing wine from Colorado grown fruit, but with cold-weather induced low yields the past two years, the winery had to source fruit from Washington State this year. And these were my favorite wines, wines that I've ordered online in the past: Riesling, Gewürztraminer, and Lemberger. Since Carlson possesses a large portfolio, there were about a dozen of Colorado wines that we were able to sample, including a few rather nice fruit wines. But the biggest surprise was their version of a White Zinfandel or Blush wine, the Prairie Dog Blush - a kitchen sink blend of Lemberger, Gewürztraminer, Seyval, Muscat Canelli, and Orange Muscat. This is a fun wine, particular when hanging out - listening to Parker Carlson describe his operation. Another bonus, all Carlson wines are priced under $13. 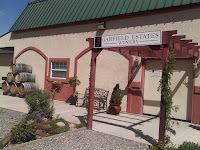 Located near Carlson is High Country Orchards and Vineyards, a new winery which augmented their famous peach orchard into producing wine from Bordeaux grapes: the Colterris (from the Colorado land) series. 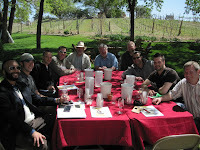 After a short orchard and vineyard tour we sampled their two wines - the varietal Cabernet Franc and Cabernet Sauvignon. These were both decent wines, particularly from such a young winery and I would love to revisit to see how the wines mature over time. 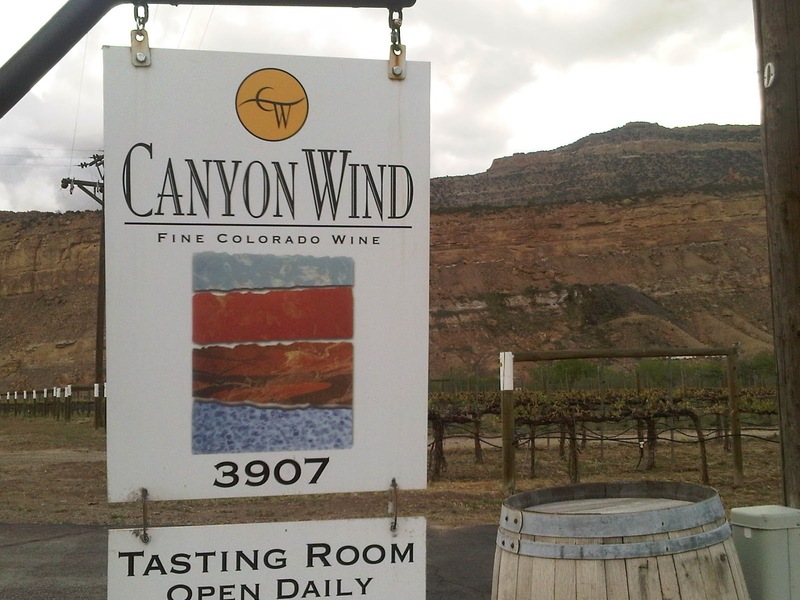 Canyon Wind Cellars and Garfield Estates Vineyard & Winery are situated not far from Carlson and High Country, but because of the multiple mesoclimates within Palisades, they might as well be in different AVAs. 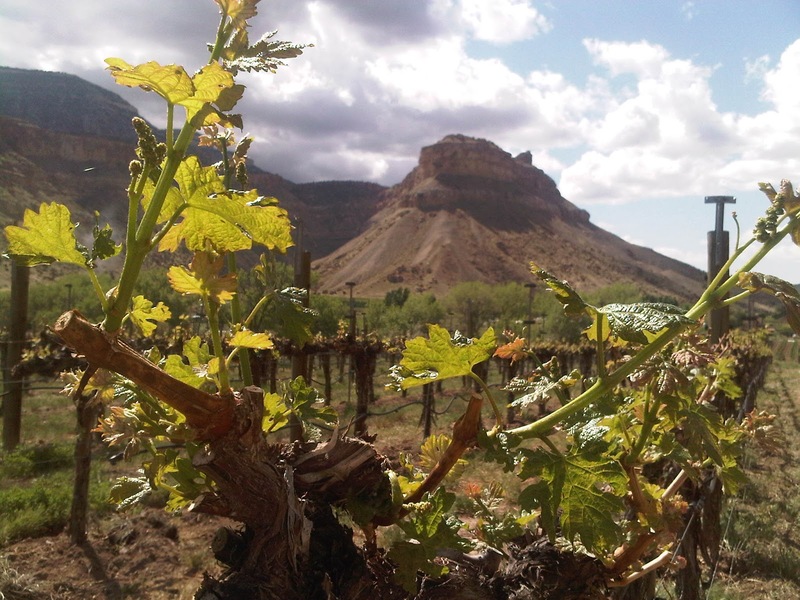 The vineyards at Canyon Wind Cellars receive frequent and larger bursts of wind (hence the name) and even at similar altitudes, bud break normally occurs first at Canyon Wind than at Garfield Estates. Regardless both of these wineries produce very solid wines. Canyon Wind offers three brands, the lower end - but nicely done 47-TEN series, a varietal series, and a newly launched high end label Anemoi. The Anemoi wines are blends named after the mythological Greek Gods of wind, and my favorite was the Boreas - 100% estate grown comprised of 43% Cabernet Sauvignon, 21% Merlot, 21% Cabernet Franc, and 15% Petit Verdot. The 47-TEN wines are excellent values at the common $13 price point as are the varietal wines, priced from $15 (whites) up to $25. during a dinner hosted by our friends at Nomacorc. 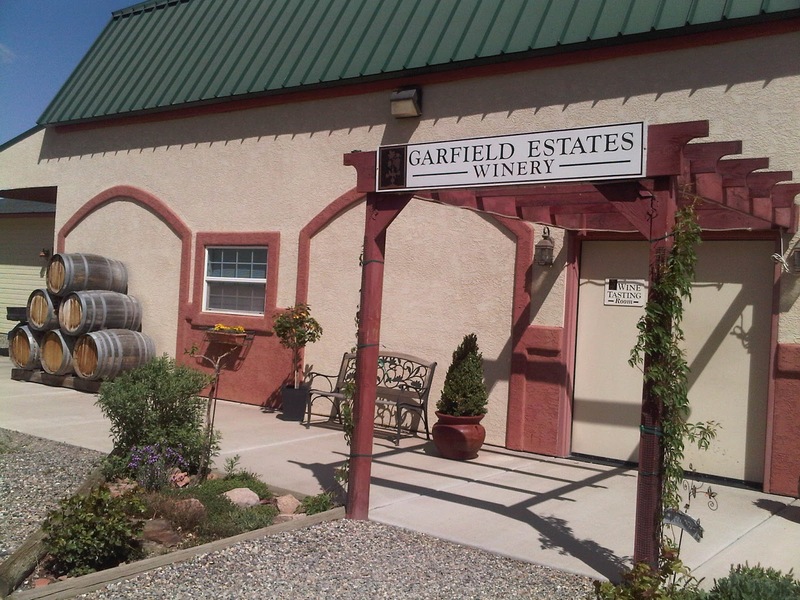 I think what makes Garfield so special, is that proprietor Jeff Carr understands that Colorado has an infant wine industry. He acknowledges he doesn't yet know what grapes grow best. But he doesn't plan on forcing grape varieties that may be recognizable, but not acclimated to the soil or climate. And even with the better known grapes, such as Cabernet Franc, he doesn't want to manipulate it into a big Bordeaux styled red - but rather allow the grapes to produce a softer Chinon style. Despite the excellent wines that we tasted, we noticed a few deficiencies within theses two AVAs. 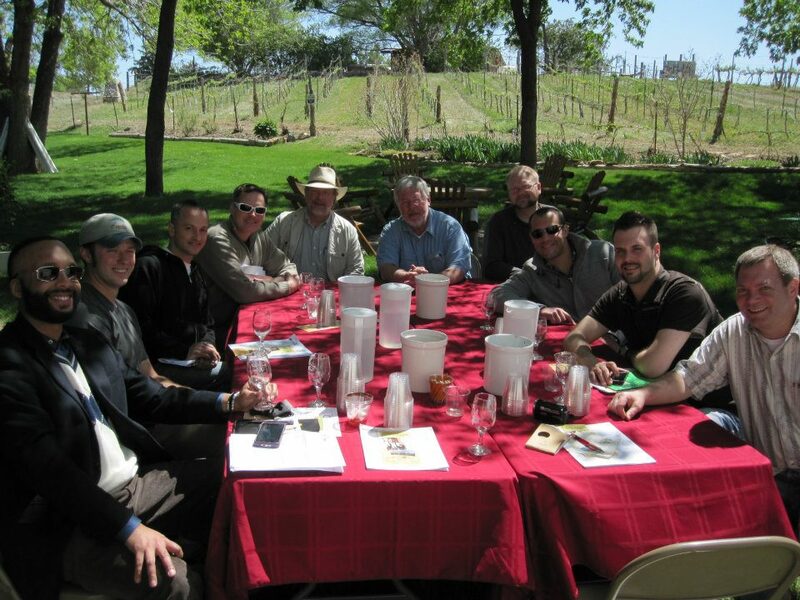 First, there appears to be an absence of cooperation and critiquing among the wineries. Yes the wineries encourage visitors to seek out neighboring wineries and there are shared events - there doesn't seem to be regular meetings to discuss common issues and to sample and critique each others wines. In Northern Virginia, winemakers meet monthly to share wines and all must be prepared for Jim Law's analysis. This elevates each winemaker's game which in turn improves the wines made in the entire region. Second, there appears to be a trend to plant grapes that are popular and not what may grow as best in the environment. Yes, they plant grapes associated to that elevation, but not once did we hear, "Before establishing the vineyard, I consulted a viticulturist to determine which grapes to plant in the vineyard and in which specific plot". Where are the Lucie Morton's of Colorado. Just take a look at Maryland's two best wineries, Black Ankle Vineyards and Sugarloaf Mountain Vineyard, both who consulted with Morton before planting their respective vineyards. Give Horst Caspari a call. I should have noted that Colorado winemakers in the Front Range Winemakers Association do meet to discuss issues and critique wines. As far as I know, winemakers in the Grand Valley and West Elks AVAs so not. Interesting comments on high countryside wine realities. You almost give us a reason to extend our Colorado stay as we travel.